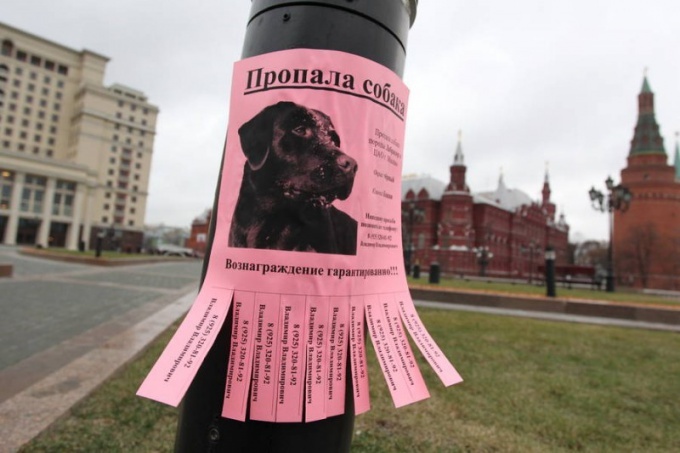 The ad about the missing dog should be a minimum of text to contain a maximum of information about the animal, its appearance and habits, the conditions of remuneration. It well-written text improves the probability of return of the pet owner. How to gain the icon "dog"
Type the text ads on your computer, for example, in Word format. First, it will improve "readability" of the text, and secondly, you can easily propagate his or print ads again. Highlight the main ad text, namely the words "Lost dog". The larger letters will allow passers-by to understand the gist of the ad. Those who do not know anything about the found dog, I will go further, those who have some information, read the announcement completely. Describe the appearance of a lost dog. Specify the breed, color and gender of the individual. List the signs by which to know the dog from among the representatives of this breed, for example, torn ears, a special spot, a bite mark. Also describe the collar or leash, if he was with the dog at the time of loss. Specify pet's name, note whether it responds to it. If the dog responds to some voice commands, also indicate this in the ad text. Note in the ad where the dog got lost in the Park, the Park, on the street, behind the garages. Paste in the ad a photo of the dog. This will help to identify the animal those people who do not understand the names of species. Select the photo, which shows the proportions of the pet, not one face or front legs. Provide information on remuneration for the return, if it is implied. Leave a contact number in the ad text and on the detachable parts. In addition, you can specify what time is best to call if, for example, you live a small child. Print the announcement on bright paper, to make it conspicuous. Make cuts at the bottom, so that passers-by could easily tear off a piece with a phone number. Place the ad in places where it can be sent to your dog. But please make sure that putting up ads is not prohibited in this place.